ePublishing Knowledge BaseePublishing Knowledge BaseePublishing Knowledge Base Creating and Managing EventsHow do I control which attendee information is required for event registration? 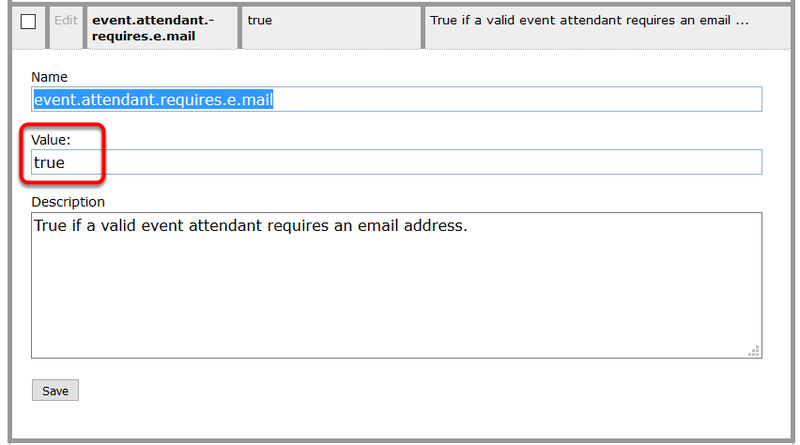 This article provides information on how to designate which fields an event attendee must fill out when registering. In other words, these fields are required. To learn how to set up registration for an event, please read this article: How do I create a registration form for an event? From there, scroll down to the events settings, as designated by the word event. To edit a setting, click Edit next to the name. Click edit next to event.attendant.requires.company. Type true or false in the Value field (circled below) to indicate required (true) or not required (false). true - This means the user must include a company name when registering for the event. 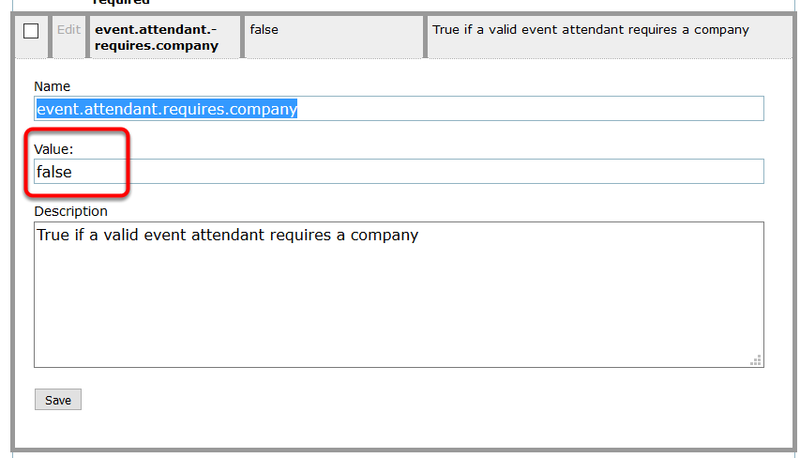 false - This means the user does not have to include a company name when registering for the event. Click edit next to event.attendant.requires.e.mail. Type true or false in the Value field (circled below) to indicate required (true) or not required (false). true - This means the user must include an email address when registering for the event. 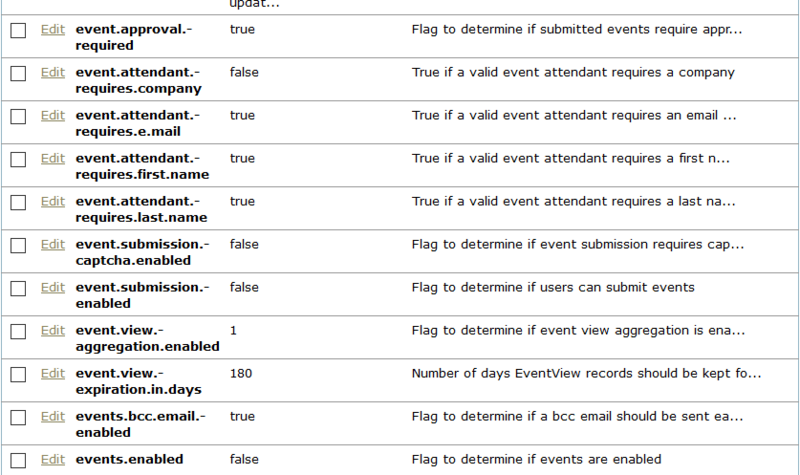 false - This means the user does not have to include an email address when registering for the event. Do NOT change the content in the Name or Description field. 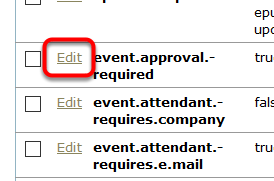 Click edit next to event.attendant.requires.first.name. Type true or false in the Value field (circled below) to indicate required (true) or not required (false). Zoom: Click edit next to event.attendant.requires.first.name. Type true or false in the Value field (circled below) to indicate required (true) or not required (false). true - This means the user must include a first name when registering for the event. 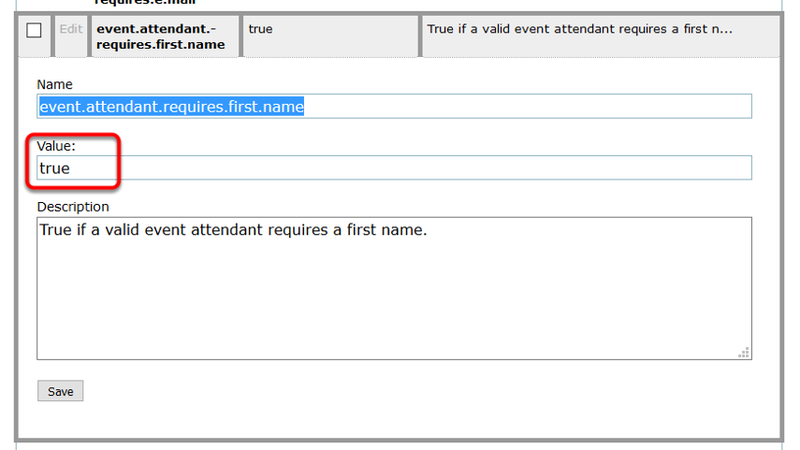 false - This means the user does not have to include a first name when registering for the event. true - This means the user must include a last name when registering for the event. 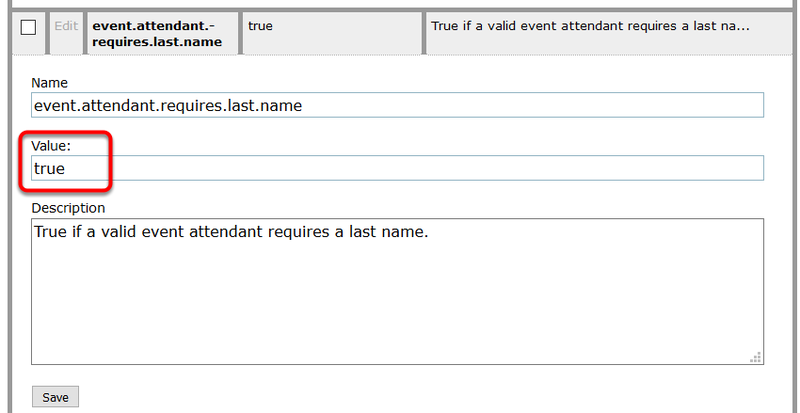 false - This means the user does not have to include a last name when registering for the event. To test changes, register for an event on your website and fail to fill out a required field before submitting. Note: If you do not have access to these System Settings and need adjustments made, contact your site admin or ePublishing Project Manager. Prev: How do I review the list of attendees who have registered for an event? Next: What are the taxonomies associated with events and what do they control?